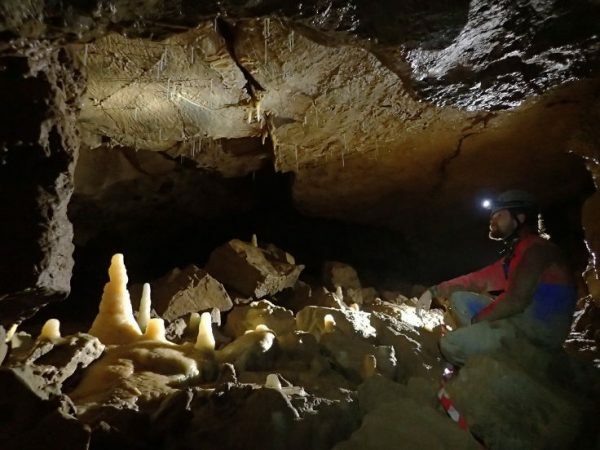 Pete had been in touch with the club about doing some caving with us and with a week off work I was happy to oblige so we arranged a trip to Busman’s Holiday via the Ogof Cnwc entrance to Daren Cilau. We met up in the Daren car park but Pete soon realised that he’d grabbed the wrong helmet as the one in his boot was tiny and didn’t come close to fitting him. I tried it and thought I could just about get away with it but then there didn’t seem to be any way of attaching a lamp so we were still a little stuffed. The only thing for it was to drive to mine to pick up my spare lamp/helmet and back, which was going to take the best part of an hour and a half. We jumped in Pete’s car and pulled out of the car park onto the Hafod road but had to immediately reverse up for a minibus full of kids in oversuits, which turned up into the car park. “I wonder if they’ve got a spare helmet?” I joked. “Might be worth a try.” replied Pete. “Isn’t that Vaisey driving?” I asked. “Do you know him?” asked Pete back and so we drove back into the car park. Yes, it was Vaisey Bramley, leading a group from the Gilwern Outdoor Education Centre, yes they did have one spare helmet and lamp with them and yes we could borrow it! Thanks again Vaisey, you are a life saver! 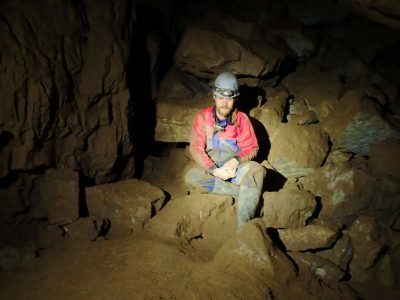 We arranged how we were going to return the helmet and headed up to cave, which Pete hadn’t been in before. The first part of the cave was muddy as usual but with all the recent rain, it was wetter than I’d seen it before, with more lovely puddles to crawl through. The first 15 minutes or so of the trip aren’t the most pleasant, with the muddy and gravelly crawls but suddenly popping out into the huge and well decorated Price’s Prophecy chamber is a great experience. 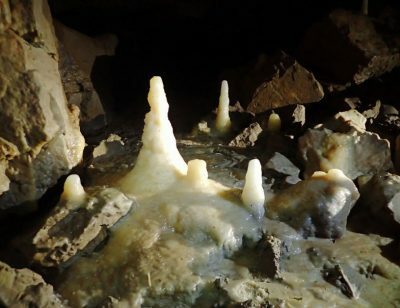 First we headed North, through another decorated chamber with a noisy inlet stream and then into larger, bouldery passage, with not much in the way of formations but a bat or two here and there. At the end of the big passage is a longish but easy crawl, that leads into the most Northerly section of Busman’s. We soon arrived at the original breakthrough point, up from Antler Passage, where we stopped for a quick bite to eat. On the way back I took a few photos and pointed out some of this newfangled Cryogenic Stal on the floor of the big passage. A check of the watch back at Price’s Prophecy showed we still had time to have a look at the southerly section of Busman’s. We wanted to time it so we’d get back to the car park a little bit before the group from the Gilwern Centre were due. The passage to the South is smaller than to the North and we soon reached a corkscrew dig up through boulders, quickly followed by another crawl through a dig. 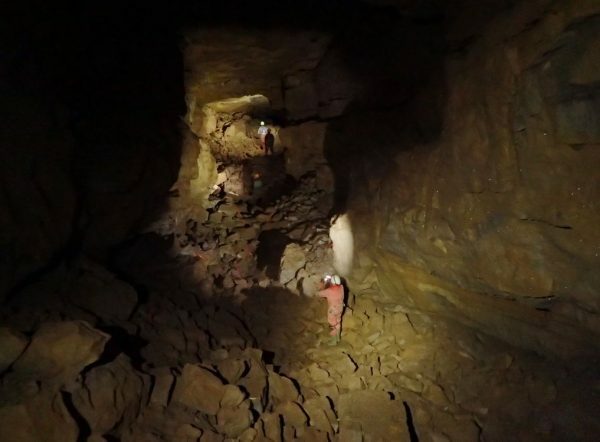 We then entered another large section of the passage at Stal Boss Chamber. There is a smaller rift passage to the right here, which we had a look down as it’s a bit of a change from the large, bouldery passages we’d been in so far. After taking photo’s in the decorated chamber, we started out. While crawling out I realised I’d only taken photos in the big passages. Looking ahead, Pete was in a nice small section so I called out about taking a photo there and asked if he was in a dry spot. Getting a very resounding NO! in reply, I didn’t push it further and we carried on out! 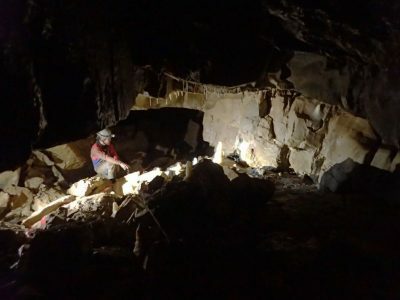 Roughly three hours underground in all, an enjoyable shortish trip into some impressive passage, rounded off with a nice pint in Llangattock. 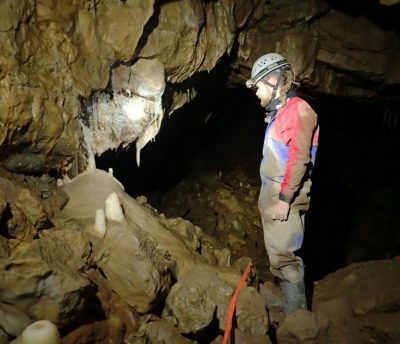 This entry was posted in logbook and tagged Cave, Daren Cilau, Llangattock, Ogof Cnwc by Huw Jones. Bookmark the permalink.